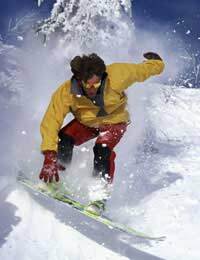 Though it is possible to learn to snowboard without any professional instruction, the vast majority of people will pick up the techniques far quicker if they take a few hours of lessons. This can either be during your trip away, or before you leave on a dry slope or snow dome. After you’ve been kitted out with the correct gear, the first thing you’ll need to establish is whether you are goofy footed (i.e. you place your right foot forward) or regular footed (you place your left foot forward). As the name suggests, more people are regular, with only about 1 in 4 goofys. Those who have tried other board sports such as surfing, skateboarding or wake boarding will already know their preferred stance, but if you’re completely new to board sports, there are a few tests to establish which way round you are. Imagine a frozen puddle is in front of you and that you are going to run over it and slide across. Which foot would you put forward whilst sliding? Get a friend to give you a little push from behind when you’re not expecting it and see which foot you place forward to stable yourself. If you’re still not sure after this, try setting up your stance in the regular position, and see how you get on. If something just doesn’t feel right, swap your stance to goofy and see how that feels. A snowboard has two edges, referred to as heel edge (that closest to the heel) and toe edge (that closest to your toe).Find a very shallow slope, strap both feet into the binding and stand up with your board at right angles to the down slope. You should be facing downhill. Start off by putting all your weight on your heel edge. This will force the heel edge to bite into the snow and therefore will prevent you from moving. Gradually take some of the weight off your heel edge and very gently transfer your weight onto your toe edge. Your board should now start to slide down the slope. Try to keep an equal amount of weight on each foot, or the board will begin to spin. When you have moved a few meters? Put all of your weight onto the heel edge again to stop the board moving. Continue to practice this until you have full control of your heel edge, and can stop and start without falling over or spinning around. Next? start off facing up the slope with your board at right angles to the fall line. Start off putting your weight on the toe edge, and then gradually transfer some of your weight to your heel edge until the board starts to move down slope. Like before, let the board run for a few meters and then stop it by putting your weight back on to the toe edge. Practice this technique until you have full control of your toe edge. Once you have mastered these basic techniques, you'll be able to move on to making and linking turns.